Maggot Moon tells the story of Standish Treadwell, a boy who is labelled as ‘stupid’ because he can’t read or write very well and ‘strange’ because of his different coloured eyes; one is blue and one is brown. Standish lives with his Grandfather, Gramps, in Zone Seven, in a dystopian version of 1956. Imagine Nazi Germany had won the Second World War and their totalitarian reign had gone to the extreme. Since his parents mysteriously disappeared, Gramps and Standish are the only people living on their desolated and destroyed street. Until one night a new family move in and their actions impact dramatically on Standish’s life and the future of the Motherland. In an attempt to convince their enemies that they are the stronger nation, the Motherland is competing in the race to land man on the moon and they are gearing up to broadcast this triumph to the world and prove they are the more dominant and fearsome nation. But all is not as it seems and Standish is determined to show the world the evil and treacherous nature of the Motherland. To begin with I found Maggot Moon slightly confusing. I really wasn’t sure what was happening or even what planet we were on; all the space talk threw me a little. This wasn’t helped by the fact that Standish talks about the Motherland and the Mother Language. And then it all clicked into place. 1956, talk of the war helped me untangle the mystery. However one thing I was sure about from the start was my appreciation of Standish’s language. Standish readily admits that he is not clever, he has a reading age of 4, and according to the Motherland’s rules shouldn’t even be at his school. However this makes his description of people and the world around him fantastic. Gardner has littered the pages with similes and metaphors, which held my interest when I was too confused to understand what was happening. I love how you can tell so much about the character just from one line of concise description. This matter of fact simplicity, whilst great to read when creating a picture of certain characters, is eerily haunting when Standish describes the horrific events he witnesses, most specifically the murder of a classmate at the hands of his teacher. I was literally sat in shock turning the pages. How can he be so matter of fact? But then I guess if you live in a society where violence and dominance rule in a reign of terror you become desensitised to such acts. Overall, I enjoyed Maggot Moon. Standish was a likeable, imaginative and incredibly brave character, ready to stand up for what he believes and save those he loves regardless of the consequences. I don’t think it is a winner, but I certainly enjoyed it and would recommend it. 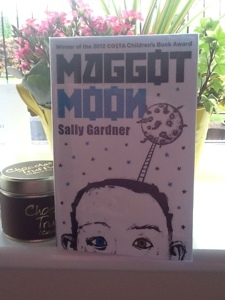 Maggot Moon is the fourth book I have read for the Carnegie Medal Award. Our enrichment club started this week and our first meeting focused on handing out the schedule for upcoming weeks, so we are all aware of when we will be discussing each book and looking at the Carnegie Medal website and our own page on there. The winner is announced the middle of June, so we will be discussing two books every fortnight, giving the students the opportunity to read one or both books ready for the meeting. I am definitely looking forward to hearing their views on some of the books, and for the time being I will be keeping my opinions on them quiet as I want to hear what they say before I mention whether I enjoyed a book or not. I am quite looking forward to running the enrichment, but at the moment I am seriously missing adult books!